After just 8 minutes under pressure (cue the Queen music! ), this comfort food dinner is done. Our homemade egg noodles have zero dairy, although you could start with frozen instead to make this dairy-free dinner recipe even quicker and easier. Since it makes 12 cups, this is a soup-er smart option for meal prep or when you’re hosting a crowd. Miss cream sauce? Marinara is no longer your only sauce option for a delicious dairy-free dinner recipe featuring pasta. Cashews, broth, plus plenty of garlic and shallots make this faux-fredo taste surprisingly similar to its buttery, creamy cousin. Toss in a bit of sautéed, roasted, or steamed broccoli to give this 30-minute meal a vitamin boost. These dairy-free milk substitutes taste great–seriously! Cure your curry cravings with this takeout fakeout. Not only is this dairy-free dinner recipe delicious and infused with Thai flavors, it’s also a simple way to clean out the fridge. 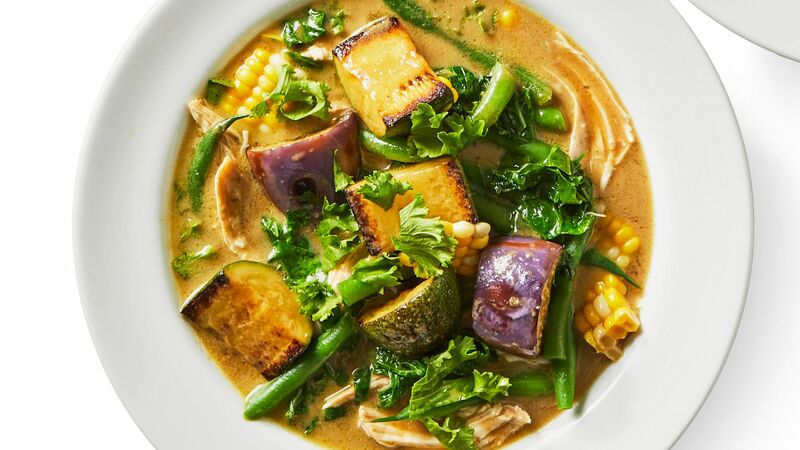 Toss any veggies and leftover grilled chicken, steak, or turkey into the coconut milk and curry sauce base. Pizza is back on the menu! 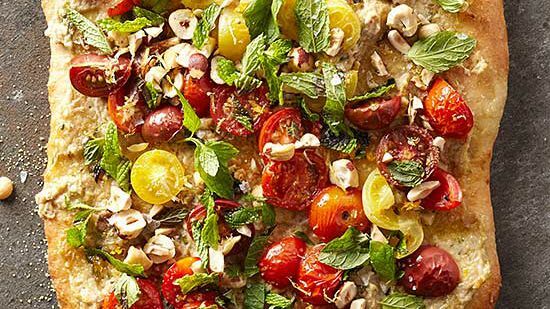 This dairy-free dinner recipe will make you feel like you’re missing nothing—even though it’s cheeseless—thanks to flavor-rich ingredients such as crunchy toasted hazelnuts, smoky baba ganoush eggplant spread, and refreshing mint leaves. Tip: For those not going dairy-free, feel free to top half with a handful of crumbled feta. Many soups start with a pat of butter (to sauté the aromatic vegetables) or end with a splash of milk or cream. Not this gluten- and dairy-free dinner recipe. 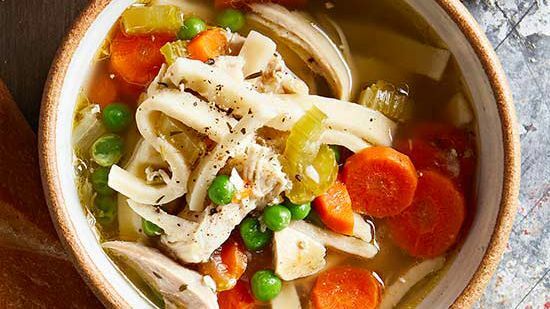 The veggies get nice and golden brown in a bit of olive oil, and each bowl of this healthy chicken soup is finished with a squeeze of lemon and a sprinkle of fresh dill. Searching for gluten- and dairy-free dinner recipes that are low in calories but not in deliciousness? 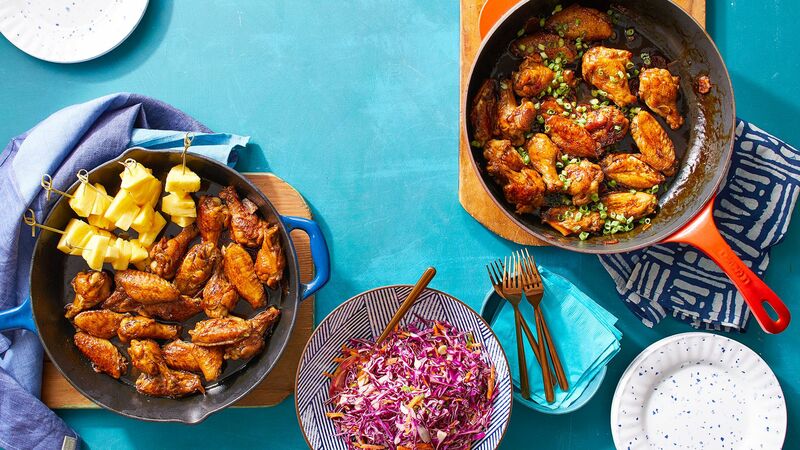 We have a winner for you with this healthier restaurant remake. 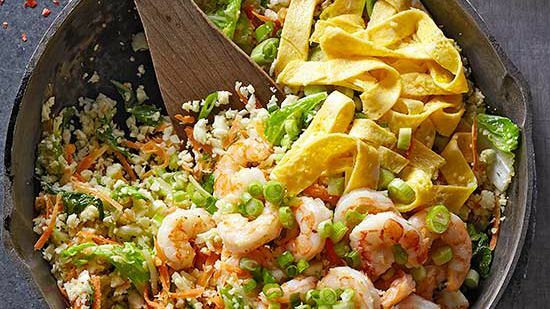 We’ve lightened things up with cauliflower rice and low-cal shrimp. Fresh ginger, garlic, and sesame oil ensure this meal tastes just like it came from your go-to Chinese restaurant. How often have you spent $10+ on a fully loaded burrito from those build-your-own bars? (And why don’t they include more guac to make up for skipping the cheese?!) 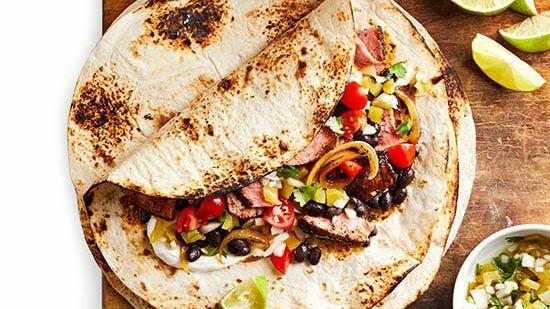 Wrap and roll your own steak and bean burrito at home instead and top it with as much avocado and dairy-free sour cream as you please. This easy dairy-free dinner recipe practically cooks itself—and does so way quicker than if you roasted beef. 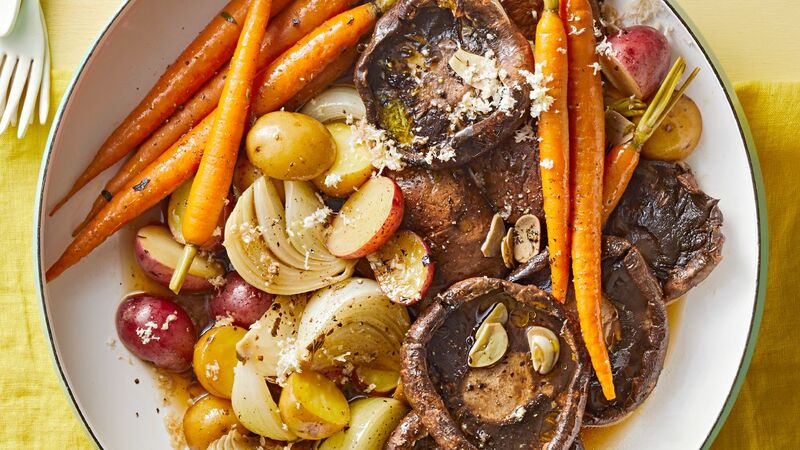 Building the meal around mushrooms means that this hands-off entrée is also vegan. 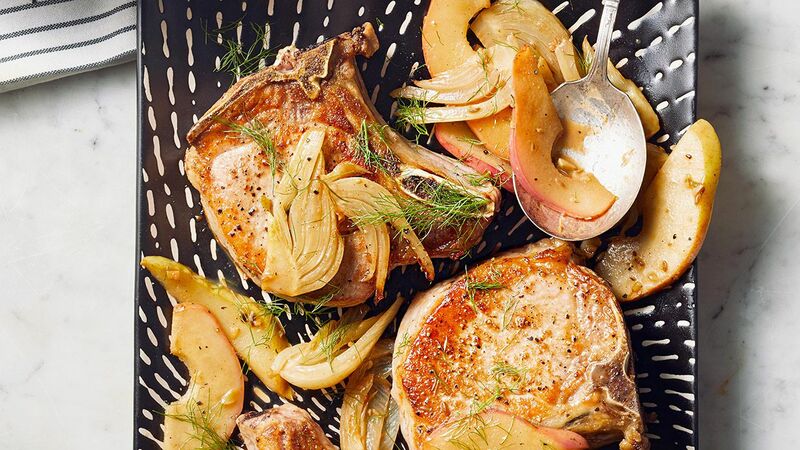 A splash of white wine cranks up the complexity of this oil > butter option. 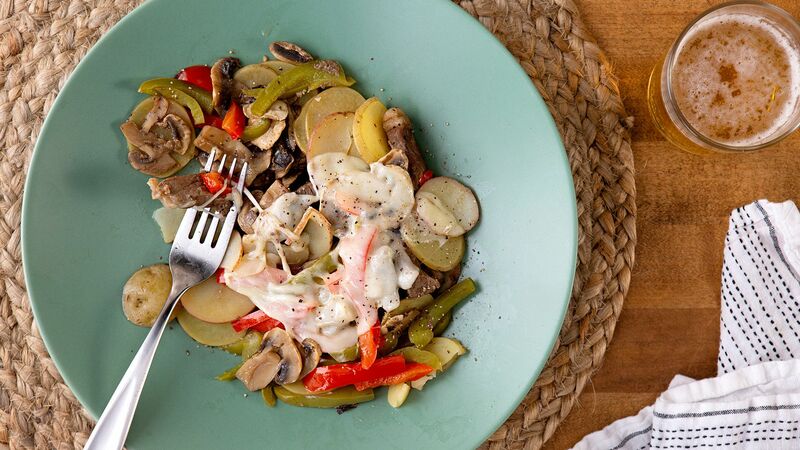 Skip the optional cheese topping, and this stove-top stew is made for serving to a crowd with differing preferences. 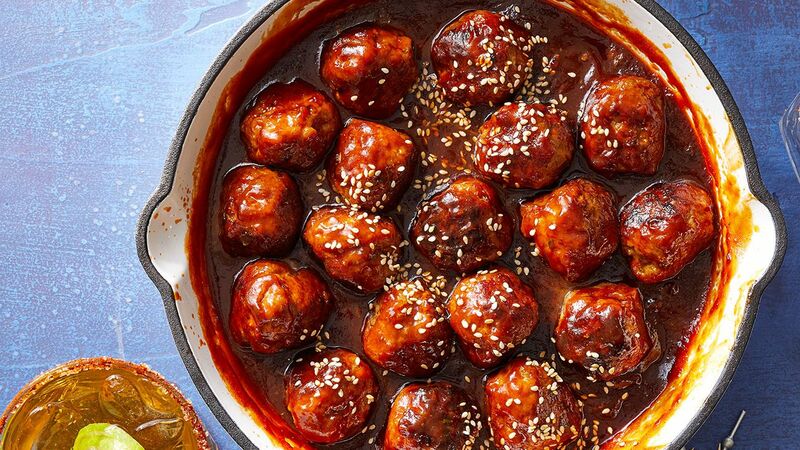 It has no meat, no gluten (if you use vegetable stock instead of beer), and no dairy! 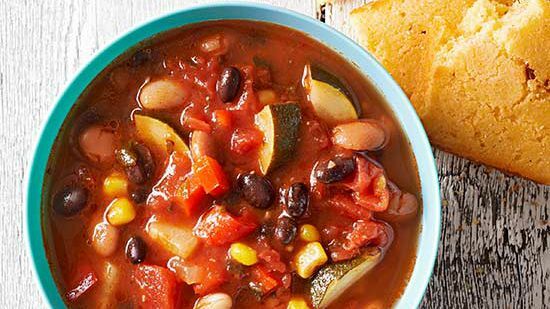 Pair this easy dairy-free dinner recipe with some vegan, gluten-free cornbread to complete the cozy meal. 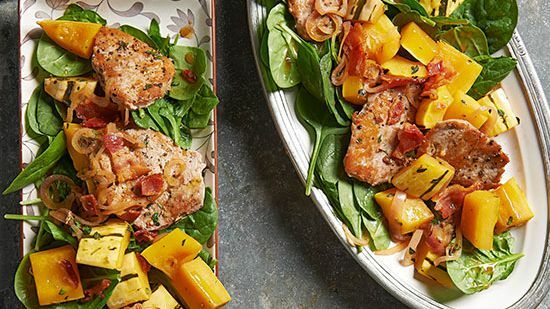 Spice up your supper routine with this delicious dairy-free dinner recipe that clocks in at just 225 calories per serving. 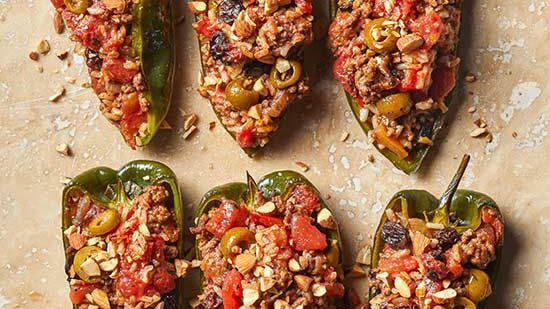 (We give you the green light to dig into two of the brown rice- and beef-stuffed peppers.) Cheese often lends a pleasant salty element to many South-of-the-Border recipes, but this one calls for Spanish olives as an alternative. 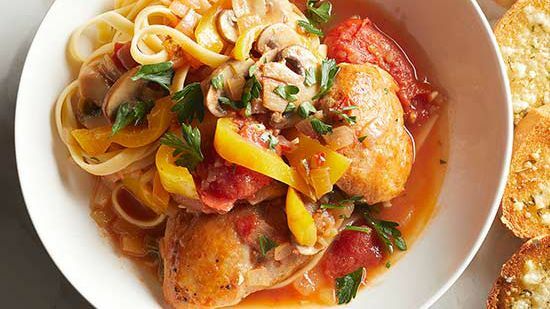 Make like an Italian and cook chicken cacciatore for dinner tonight. The white wine- and garlic-infused sauce is begging to be drizzled over hearty chicken thighs and warm pasta. 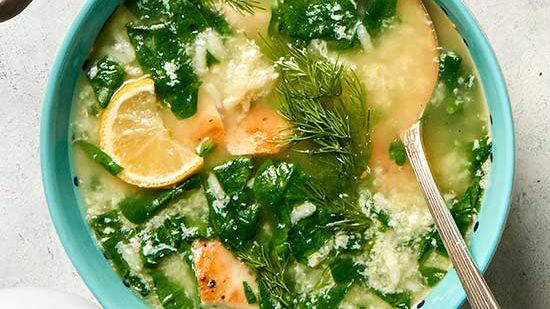 Instead of garnishing with cheese, sprinkle each serving of this easy dairy-free dinner recipe with fresh parsley. Time for a pasta party! 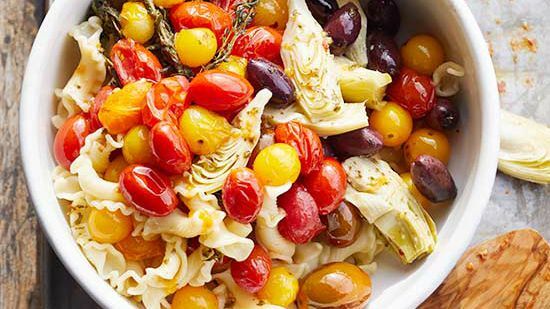 The “sauce” that tops this dairy-free dinner recipe is loaded with healthy Mediterranean diet ingredients like extra virgin olive oil, artichokes, olives, and fresh herbs. The crown on top: a little (or a lot) of crushed red pepper. 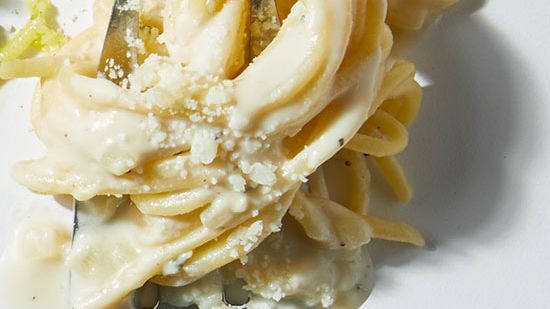 Similar to our cashew Alfredo, this dairy-free dinner recipe features a “cream” sauce with zero cream. 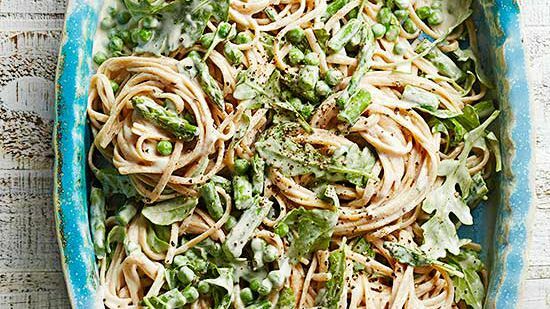 Here, chickpea flour and a variety of spring veggies join the party. It’ll be a cinch to entice picky eaters to devour peas, spinach, and asparagus when they’re drenched in the luxurious, garlicky pasta sauce. 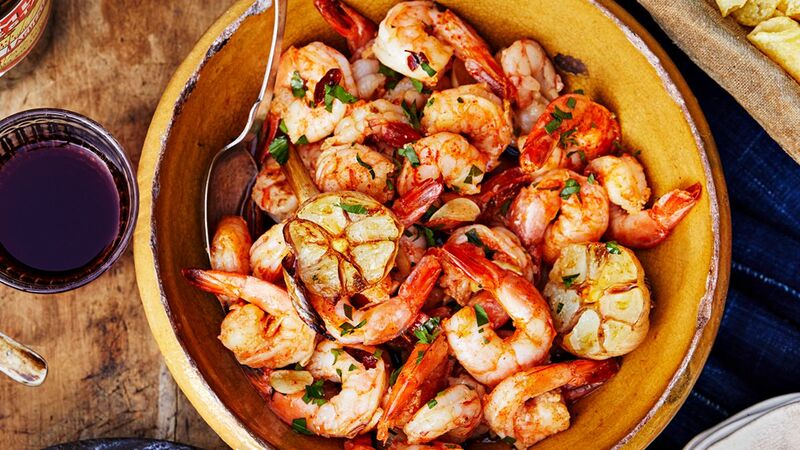 Think of this gluten- and dairy-free dinner recipe like shrimp scampi minus the butter. Done in just 25 minutes, the Spanish meal is best served with plenty of crusty bread to soak up every drop of the spicy garlic oil. 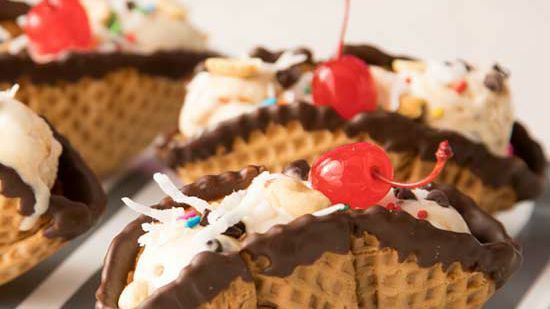 If you run out, we give you full permission to lick your plate. 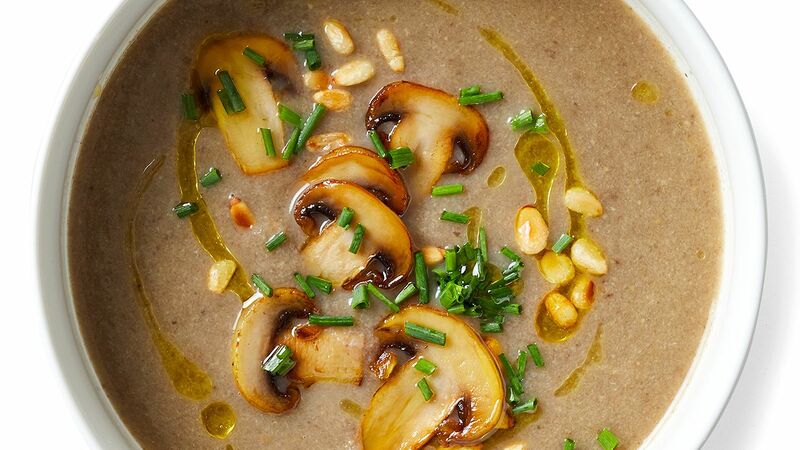 Sautéed mushrooms and onions can be shockingly similar in texture to a cream-base soup. How? Puree them with vegetable stock and sherry in this easy dairy-free dinner recipe. Offer this 30-minute meal with a side of crackers or breadsticks for dunking.